Looking for reasons today’s unemployment figures are so wild. Today the ABS released its usual monthly employment figures. It’s been a normal-seeming month, so what happened next was pretty surprising. The economy set a record for the most jobs added in a month! Is there something wrong with the way the ABS treated the data? Maybe. Seasonal adjustment is something they do every month. It allows for months to be treated the same and it is usually helpful. You can compare, for example, the underlying job trends between December, when shops are hiring for Christmas, with January, when all those casuals get let go. It seems like August is a month where the seasonal adjustment team is very busy. The survey result for August was +32,000 jobs before they seasonally adjusted the data. The adjustment took it to +121,000 jobs. But if months start behaving differently to how they behaved in the past, seasonal adjustment could make things worse. 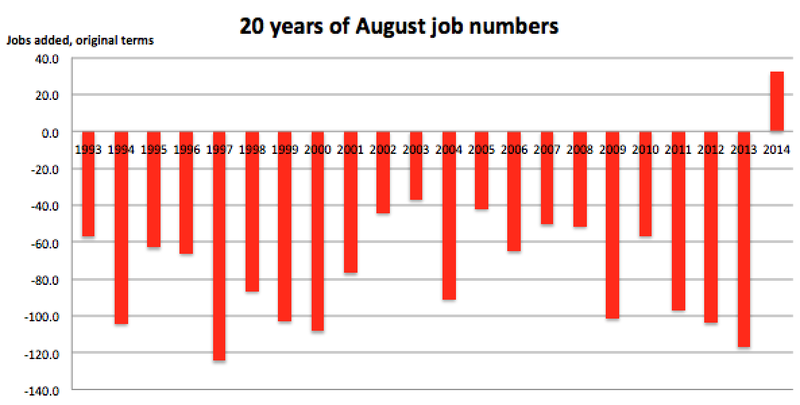 Here’s 20 years of August numbers (prior to seasonal adjustment). Something is different this year. Could something else be to blame? The ABS got in big trouble last month, when unemployment seemed to shoot up in seasonally adjusted terms. Everyone blamed a new survey design and counselled us to ignore the monthly move. It seems they may have been right and what I wrote at the time, arguing for a focus on the more recent data, was unwise. Is it that August has started behaving differently and seasonal adjustment needs adjustment? That randomness explains the outlier? Or that the economy has really, truly, but very quietly, turned a corner and added a lot more jobs than we expected? We may need more data to answer this question… Stay tuned for next month! This means that our massive apparent boost in jobs is dependent on raw survey data that shows 80,000 full time jobs were lost. I trust the ABS but this is weird. +112,000 is not even a record month for part-time jobs. March 2014 set the record with +168,000. I ran a correlation that showed full time and part time jobs growth are weakly negatively correlated. Perhaps that means since part time job growth was high they expected a really big fall in full time jobs, that didn’t materialise. Previous Previous post: “Tearing up the contracts” for the road tunnel means there is an actual difference between the political parties. Wow! Next Next post: “Burn it down, start again.” Why a big fire might actually be good urban policy.